The Yankee Entertainment and Sports Network, known as the YES network, is a regional TV channel in the U.S. which operates in the New York region, along with a number of channels in Pennsylvania and Connecticut. Added to that, some satellite TV packages focused on sports include this channel in the U.S. This channel's main focus is broadcasting shows and games featuring New York-based teams such as MLB's New York Yankees and the NBA's Brooklyn Nets. Football coverage in this channel may include New York-based teams, especially New York City FC. 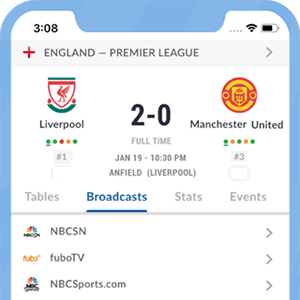 Aside from the MLS side mentioned above, this channel agree to broadcast some European football games involving Manchester City, which is owned by this network's associates. This agreement includes broadcasting shows produced by the club as well. *Got itLive Soccer TV does not provide YES Network live streaming. The information provided on this page is simply YES Network soccer TV schedule. 17 live New York City FC matches on YES during the 2017 season.